It has been a long time that I haven't reviewed anything from my favorite brand "MAC COSMETICS". So I thought why not for a change I post something from Mac that was pending from long back. Mac cosmetics is now available online at Nykaa so it is really easy to buy from home. In fact Nykaa stock up all new launches and limited editions too on their site which is like a boon to many people who don't have Mac store near their home. "M.A.C Look In A Box - Call Me, Love" is a limited set that was launched long back. The kit contains full sized a retro matte liquid lip color, a lip pencil, and a lip primer. Price:- Rs.3250/- for the entire kit. A plum-toned kit for lips with Retro Matte Liquid Lipcolour in Call Me, Love, Pro Longwear Lip Pencil in More To Love and Prep + Prime Lip. Retro Matte Liquid Lip colour: Apply directly to lips using applicator. - Apply directly to lips before or after any M∙A∙C Lipstick or Lipglass application. - Sharpen with Pencil Sharpener / Small. - Apply a thin coating over entire lip area and over lip edges. - Follow with lip color. - If desired, line lips. "M.A.C Look In A Box - Call Me, Love" comes in a box like the packaging in which there is a retro matte liquid lipstick, a lip pencil, and a prep +prime Lip as a set. All the description of lip products is written on the back of the box. 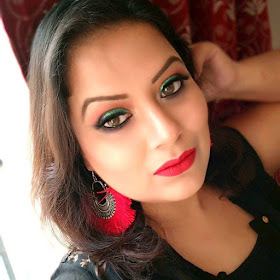 I am a Mac lover truly by heart and soul, so when nykaa launched M.A.C Look In A Box collection I knew that I had to pick the box "CALL ME LOVE" as it is all pinkkkkkk :P.
Moreover the price of all 3 lip product in the kit was a steal deal for me. The box has one retro liquid lipstick named "call me love" which is a deep blue-based fuschia. The color is really bright pink. A perfect shade for warm skin tone fair to medium beauties. Mac Retro matte liquid lipsticks are one of the most comfortable liquid lipsticks that I used so far. They are always great in pigmentation and staying power. The lipsticks turn super matte on my lips within few seconds of application. It stays pretty 7 hours+ on my lips if I don't eat any oily food madly (lol... I do take care of that whenever I apply a liquid lipstick). The lipstick has a very mild fragrance. 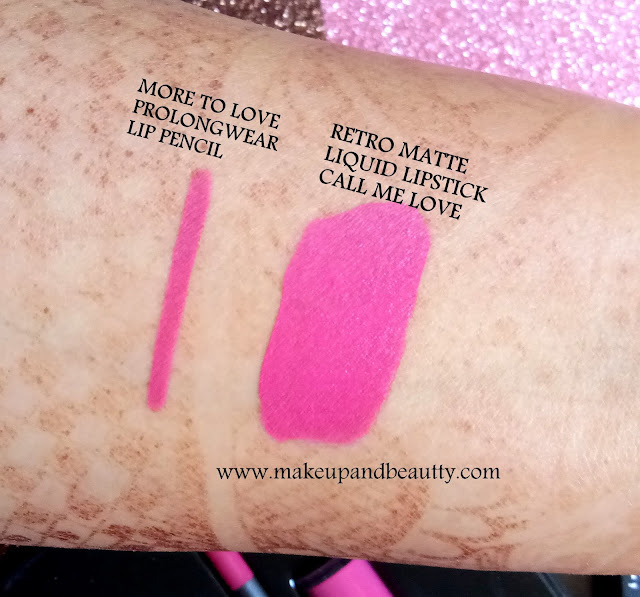 Coming to the lip pencil "More To Love" an intense bluish pink which definitely goes pretty well or I can say which goes perfectly with the retro liquid lipstick "Call Me Love". The lip pencil is from Mac prolongwear for which the quality of lip pencil is awesome. It has the creamy texture and glides easily on my lips. It has good pigmentation that covered up my pigmented lips pretty well. It doesn't dry out my lips if I use this lip liner as lipstick like most lip liners do. I am really loving the formula of prolongwear lip liner. They are true "prolongwear". Moving to the next and last product that I got in this kit is Prep +Prime Lip. It is a lip primer which is supposed to be applied as a base on your lips to smoothen out dry flaky lips before you apply any lipstick. It can be used as lipstick topper too if your lips feel dry due to matte texture of any lipsticks. The lip primer increases the staying power of the lipsticks. It is not oily in texture and that's why you can wear any matte lip color on top of it without being worried that the oil of the primer might feather your lip color. The lip primer is fragrance-free and definitely worth recommending for all. So that's all for today...see you in my next post. Labels: limited edition, lip primer, liquid matte lipstick, MAC, mac collection, mac cosmetics, mac limited edition. mac cosmetics, mac liquid lipsticks.